So we have a little bit of a problem brewing this week; no podcast. Due to unforeseeable circumstances this week there will be no podcast and no- wait, no, its just the podcast thats missing. I'll still be blogging, just no podding. The Knights of the Old Republic comics are set during the Mandalorian war that Revan came to power in. 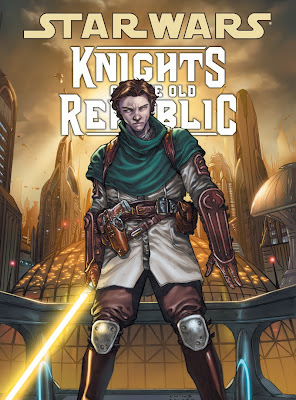 It's set before the KOTOR games (by Bioware) and is a really nice piece of history to show how Reven and Malak were before the darkness of the Sith turned them against those they swore to protect. The story does not follow Revan or Malak, however. It follows the adventures of failed padawan and outlaw Zayne Carrick as he runs from his former masters who framed him for the murder of his fellow padawans after they had a shared vision that vaguely indicated that one of the padawans might be the next dark lord. While the vision was vague (and ultimately wasn't even related to their padawans, other than that Zayne meets the new sith in Malak) the masters of the order killed their padawans and, when Zayne arrived late, attempted to kill him. Zayne, however, accidentally escaped, falling and tumbling his way to the undercity with a criminal named Marn that he had recently arrested. They meet a pair of arkanians as the authorities closed in and fled the planet. Over the course of the series Zayne tries to clear his name and get his vengeance, ultimately accidentally aiding Revan and Malak to their darkness. Creating the Dark Lords his masters had tried to avoid. Its a really interesting story about visions. Try to avoid them and you risk creating them.